This product is often used to create temporary tennis, basketball or pickle ball courts and where the use of paint is not practical or desired. INSTRUCTIONS - To install our court striping tape simply apply it to a clean, dry surface and press it on so that it completely conforms to the surface. The temperature should be in excess of 50 degrees. Dry, clean, sun warmed asphalt or cement is ideal. Best adhesion can be achieved by going over the tape with a heavy rubber tire (dolly) roller or by using your vehicle tire. When using a vehicle be careful not to turn the steering wheel while on the fresh tape. Also, avoid applying the tape to damp asphalt or cement. Also, it is best to apply when it has not rained in 48 hours. After application the tape is ready for use, however, full curing occurs after about 48 hours and it is best if it does not rain during this time as well. I recommend you apply the tape and press it in very well. Then after 24 - 48 hours press it in again. It is always recommended that you test a couple of pieces on the surface you are going to mark and leave them down for a day or so. If you need test pieces you can email me at steve@reflectivestore.com. 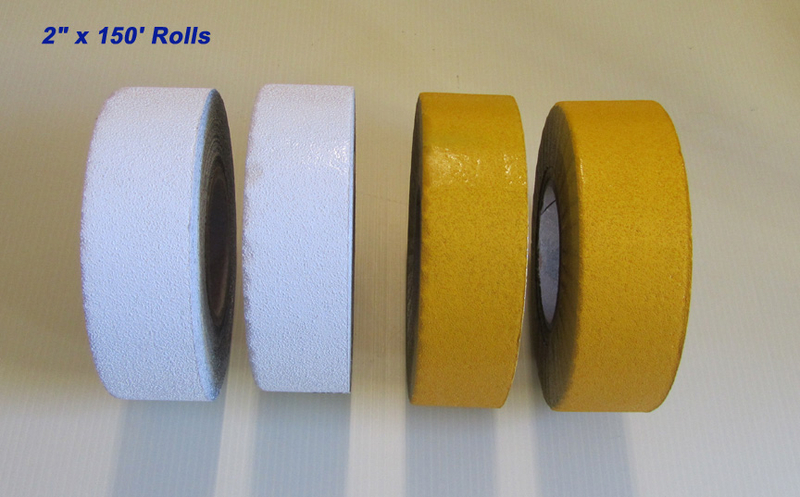 We carry the foil backed court tape in both WHITE and YELLOW. Click above to make your choice.